Luwero’s 12th annual youth camp took place between 10th & 15th September. The theme was ‘David: A man after God’s own heart’ and involved a series of studies about the life of King David including his anointing and his contacts with Saul, Jonathan, Goliath, Abigail, Mephibosheth, the Amalekites, the Philistines, Bathsheba, etc. Time was also taken to study some of the psalms penned by David. A total of 16 teaching sessions and several workshops, each lasting between 1 and 1½ hours, were held over the 5 days. Other local speakers also attended for some teaching sessions. Each day commenced at 5.00 am with ‘Morning Glory’ – a time of worship and praise and concluded with ‘lights out’ at 10.15 pm. 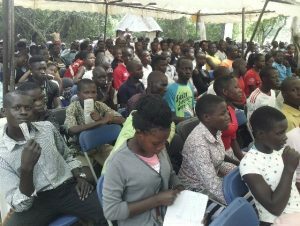 Approximately 750 young people attended this year’s camp representing 20 different tribes from across Uganda, Rwanda and South Sudan and drawn from numerous churches from various evangelical denominations. A key highlight was the fact that during the week 25 young people professed to accept Jesus as their Saviour. As well as plenary teaching sessions and workshops this year’s camp activities also included, community support initiatives including visits to the local hospital, prison and police station where gifts were given to patients and prisoners as well as time spent talking to and praying with them, HIV/Aids testing clinics, games, sports, competitions, singing and dancing. Visiting guest artistes and other singing groups were present on a daily basis. A special event was also held this year to celebrate the fact that 25 couples first met at the youth camp and have subsequently married during the past 12 years. The final camp session was an all-night prayer time on Friday night/Saturday morning. Again this year we were able to present Bibles to all the young folk who did not have their own copies. Gift presentations of Bibles were also made to the armed police guards who oversaw security at the camp during the week. Once again the organisational arrangements for the camp ran smoothly. Gabriel divides the practical issues relating to the camp into about 25 sections including issues such as stewarding, registration, PA, music, cooking, interpretation and translation, dormitory facilities, etc. Each activity is overseen by a local pastor and a small sub-committee who are responsible for the detailed arrangements. 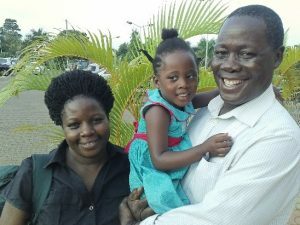 Gabriel and Deborah seen here with Priscilla, their daughter, are hosts for the camp. 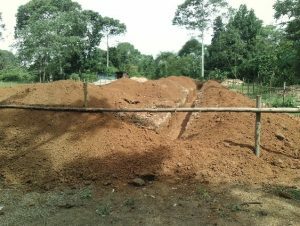 In addition to the camp being in session other work at the project continues including the excavation (by hand) of the foundations for the new boys dormitory block at the secondary school (see left), and more modules of teaching for the students attending the International Christian College Uganda Bible School which is being developed. During my visit it was also possible to check all of the corrections which require to be made to John McQuoid’s book ‘Knowing and Doing’ which has been translated into Luganda, the main local language, and which it is hoped will be published later this year.